Ray Kurzweil, the bold futurist and author of the New York Times bestseller The Singularity Is Near, is arguably today's most influential technological visionary. A pioneering inventor and theorist, he has explored for decades how artificial intelligence can enrich and expand human capabilities. Now, in his much-anticipated How to Create a Mind, he takes this exploration to the next step: reverse-engineering the brain to understand precisely how it works, then applying that knowledge to create vastly intelligent machines. Drawing on the most recent neuroscience research, his own research and inventions in artificial intelligence, and compelling thought experiments, he describes his new theory of how the neocortex (the thinking part of the brain) works: as a self-organizing hierarchical system of pattern recognizers. 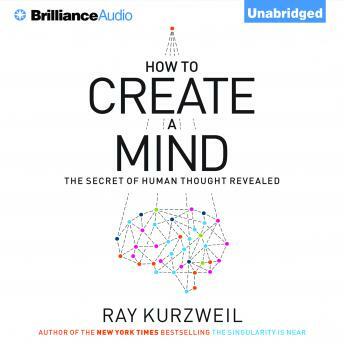 Kurzweil shows how these insights will enable us to greatly extend the powers of our own mind and provides a road map for the creation of super-intelligence - humankind's most exciting next venture. We are now at the dawn of an era of radical possibilities in which merging with our technology will enable us to effectively address the world's grand challenges. How to Create a Mind is certain to be one of the most widely discussed and debated science books in many years - a touchstone for any consideration of the path of human progress. This is a dense book meant for technical readers, but very thought provoking and insightful. Kurzweil can be a bit pompous, but is undeniably brilliant. My biggest question is that Kurzweil doesn't address at all the obvious question of whether an intelligence surpassing humans would tolerate our existence. Since this is well trod science fiction turf, its a surprising absence. Otherwise a very interesting book.